Confusing, I know - if you follow along, I've already written about my second finish of this year. Sorry about that! "I Don't Mind" was finished during the first few days of January, and then it was included in an exhibit our guild put together for the World Quilt show in Orlando that month. Once it came home, I had to get some decent photos, hence the delay. This quilt was actually started in September of 2015, at a workshop hosted by SFMQG. It was our very first workshop as a formal guild, and we chose to do an improv round robin. SFMQG member Tonya Ricucci led the workshop. We each brought a box of fabric for our quilt, plus one piece of "signature" fabric. We followed the format for the improv round robin in Sherri Lynn Wood's Improv Handbook for Modern Quilters. Starting with our own box of fabric, we cut pieces with scissors and put them together into a "block". We had 20 minutes to complete our work. Then we passed the box to a friend, and they had 20 minutes to create a new "block" for our quilt, using what was in the box. For each round we added a small piece of own "signature" fabric to the mix - a way of "signing" the block we created. So at the end of the workshop, I had nine or ten improv blocks. Not quite enough for a useable quilt, and we all know that I value function in my quilts! I took the blocks and added some bits here and there to create a kind of squareish "medallion", or center. Using the leftover fabric from the workshop, I cut a pile of rectangles roughly the same size. I then sliced these into a free-form "sawtooth" border of wonky triangles (thank you, once again, Gwen Marston for your inspiration). Then I added a bit of Essex Linen to break things up a bit, followed by a free-pieced piano key border, and more linen. I wanted to add some hand embroidery to the border. Rock music has always been my poetry, so I added a couple of lines from a Patti Smith favorite - "Kimberly", from the Horses album. 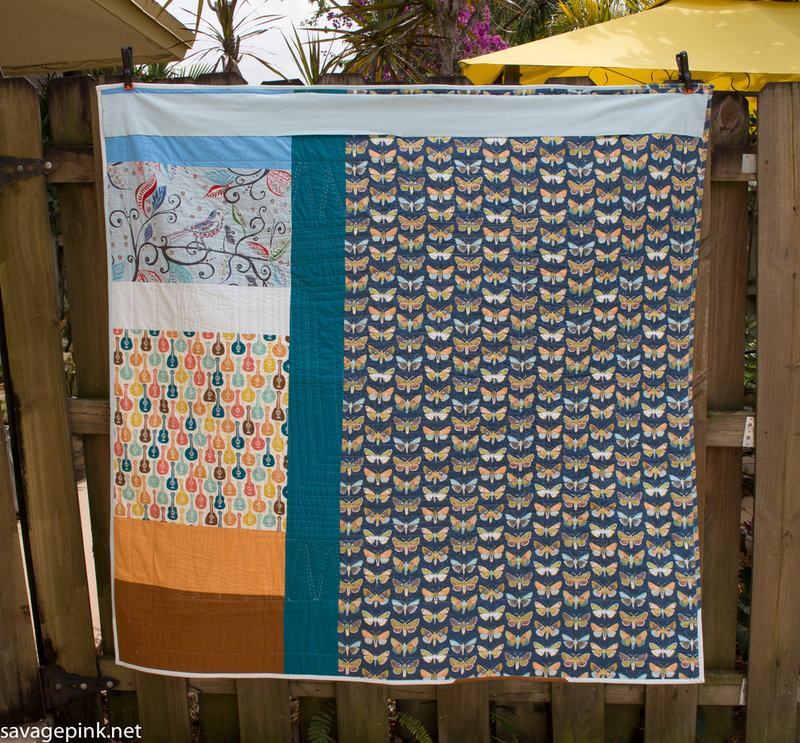 I pieced the back from various scraps and bits of yardage, and made a scrappy binding using - well, scraps! Quilting-wise, I did an FMQ square "spiral" in the center section, then did some stitch in the ditch around the borders before adding some big stitch to the sawtooth section. If anything, I am an under-quilter. This is the first quilt I have ever had in a show. It was a curated exhibit, not a "real" quilt show entry, with juries and judges. I'm not really a competitive quilter - I don't know if I ever will be, but maybe as I get more experience, I'll discover the urge to show off more. It was a blast having a quilt hanging in a show, and I got some nice feedback, which is always fun. Mostly I was really happy to be able to show something that had been worked on as a part of a group project with the guild. And now, I have a beautiful functional lap quilt for the house.